For ordering, and out of state call toll free (800-618-0666), otherwise, call (630-858-9121) and speak with one of our consultants. Get you fix for the day..... "Order Al's #1 rated Italian style beef"
"Heat it; eat it; when you need it"
Living away from Chicago, or in the suburbs, and looking to surprise someone with that special Chicago Old neighborhood "Taylor Street" Italian style beef, then call us, and we will be happy to supply you with Al's # 1 Rated Italian style beef. 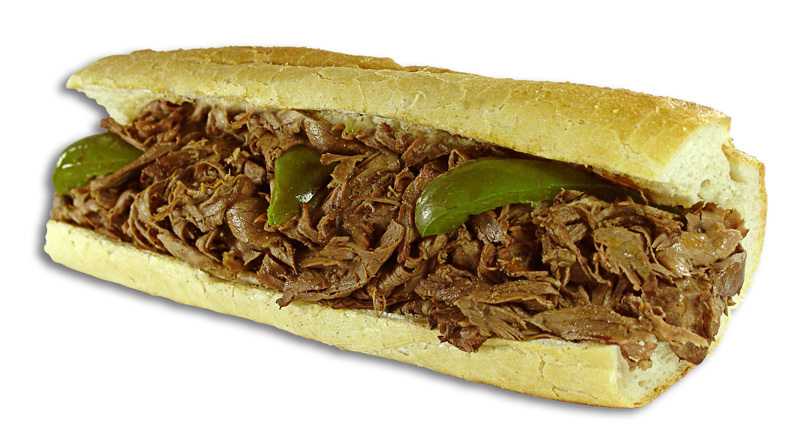 "Adam and Eve turned over a new leaf, forget the burgers, and eat Al's # 1 rated Italian style beef"
You can order Al's # 1 Rated Italian style beef, anywhere within the United States wherever Federal Express delivers. Please contact one our many consultants at (out of state call toll free (800-618-0666), 630-858-9121) to custom order any of our products, coming soon, Al's e-store on line. Al's # 1 Italian style, thinly sliced, cooked beef (2 lbs. ), 64 ounces (2 quarts) of Al's famous seasoned beef gravy, 16 ounces (1 pint) of Al's sweet peppers, 16 ounces (1 pint) of Al's hot giardinera, and 10 pieces of extra long French bread. Also included is a heavy duty thermo insulated container, and re-useable refrigerant packs. Al's # 1 Italian style, thinly sliced, cooked beef (4 lbs. ), 96 ounces (3 quarts) of Al's famous seasoned beef gravy, 32 ounces (1 quart) of Al's sweet peppers, 32 ounces (1 quart) of Al's hot giardinera, and 18 pieces of extra long French bread. Also included is a heavy duty thermo insulated container, and re-useable refrigerant packs. Al's # 1 Italian style, thinly sliced, cooked beef (2 lbs. ), 5 cooked Italian sausage links, 64 ounces (2 quarts) of Al's famous seasoned beef gravy, 16 ounces (1 pint) of Al's sweet peppers, 16 ounces (1 pint) of Al's hot giardinera, and 10 pieces of extra long French bread. Also included is a heavy duty thermo insulated container, and re-useable refrigerant packs. Al's # 1 Italian style, thinly sliced, cooked beef (4 lbs. ), 10 cooked Italian sausage links, 96 ounces (3 quarts) of Al's famous seasoned beef gravy, 32 ounces (1 quart) of Al's sweet peppers, 32 ounces (1 quart) of Al's hot giardinera, and 18 pieces of extra long French bread. Also included is a heavy duty thermo insulated container, and re-useable refrigerant packs. Al's # 1 Chicago style hot dogs, 10 cooked Chicago style hot dogs, 10 poppy seed buns, and condiments, including mustard, relish, sport peppers, and fresh cut chopped onions. Also included is a heavy duty thermo insulated container, and re-useable refrigerant packs. Call and speak to one of our many consultants at 630-858-9121 for further assistance. Please review our shipping information for important details. The customer shall be responsible for all sales, use, and similar taxes, shipping and handling charges, relating to the purchases of products from Al's Web site, see Website policies link. Delivery of our products are handled by Federal Express, and United Parcel Service. Subsequently, their delivery may be affected by weather or labor conditions beyond their control, they cannot guaranty delivery dates, and so, Al's is not able to guaranty delivery dates.